Wish you could trade the dreary February weather for some sunnier real estate climes? That’s just what your fave celebs are up to this week, snapping up (or staying pro-bono at) some delightfully warm-weather abodes. From lush Malibu to swanky Soho, check out this week’s edition of Celebrity Real Estate. RENTED: Oops, Airbnb’s done it again – they’ve gifted a megastar a super-luxe rental to kick back in, totally free of charge. Britney follows the likes of Mariah Carey’s Aspen chalet and Lady Gaga’s superbowl-sized abode, staying in this ocean-side Malibu dream house with her new squeeze and two sons over Valentine’s Day. 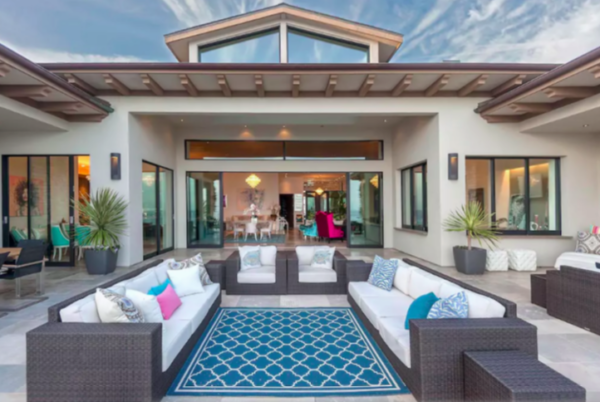 Valued at $30 million, this home features two master suites, open concept living room, theatre, gym, pool and hot tub, as well as a gorgeous outdoor seating area right next to the waves. And the crooner is extra Lucky, as this place usually rents for $7,500 per night! LEASED: The many-octave singer has opted for a change in scenery, and is now leasing a gargantuan Beverly Hills home for a whopping $100,000 per month! Built in the traditional style and including a three-car garage, fountain, theatre room, and all-white kitchen with herringbone tiles and marble countertops, it’s the perfect place for this butterfly and dembabies to catch some R&R. BOUGHT: Fresh of the sale of his Culver City condo, Modern Family star Ty Burrell has picked up new L.A. digs. Built in 1929 and featuring unique architectural details, this Spanish colonial-revival style home boasts a city-facing balcony, handmade terracotta tiles, and rustic brick fireplace. And it should make for a short commute, reportedly just a few blocks from Burrell’s fictional Dunphy family home. FOR SALE: She may have been an original Housewives of New York cast member, but Bethenny Frankel might be leaving Manhattan behind, listing her Soho condo for $5.25 million. Scooped up in 2014 for $4.2 million, she looks to make a tidy profit on the property, though she likely doesn’t need the cash, as it’s rumoured she told her Skinnygirl wine brand for $100 million. This pre-war apartment is truly one-of-a-kind, featuring a sun-filled greatroom with arched windows, 14-foot ceilings, wood burning fireplace and state-of-the-art chef’s kitchen. It also includes a truly enviable custom floor-to-ceiling walk-in closet in the master suite. Too bad Frankel’s shoe collection isn’t included!